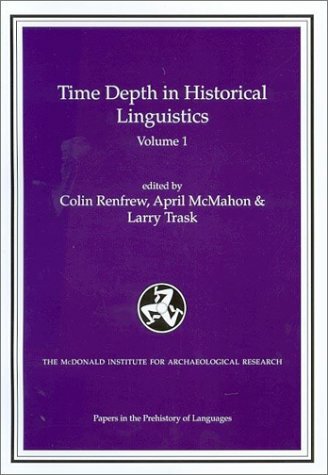 Time depth constitutes one of the most difficult problems in historical linguistics. Its evaluation is crucial for any systematic comparison with archaeological or genetic data, and hence basic to any broader historical interpretatio. This was the focus for a meeting of some of the world's leading linguistics held in 1999 at the McDonald Institute. The oft-criticised techniques of glottochronology and lexicostatistics were formulated by their leading advocates with positive results, but were also critically examined by sceptics. Linguistic palaeontology, convergence processes and morphological approaches were discussed. Specific consideration was given to Info-European, Uralic, Afroasiatic, bantu, Austronesian and Tibeto-Burman language families. This book will be indispensable for anyone seriously concerned with issues of time depth in languages, and for all archaeologists and geneticists seeking an integration between their own discipline and the early history of languages. Contibutors: Raimo Anttila, Peter Bakker, William Baxter, Peter Bellwood, Robert Blust, Lyle Campbell, James Clackson, Bernard Comrie, Aharon Dolgopolsky, Christopher Ehret, Sheila Embleton, T V Gamkrelidze, Richard Hayward, Paul Heggarty, Dimitry Leschiner, Marisa Lohr, Alexis Manaster Ramer, James Matisoff, Yaron Matras, April and Robert McMahon, Alexander Militiarev, Daniel Nettle, Joanna Nichols, Mark Pagel, Ilia Peiros, Colin Renfrew, Sergei Starostin, Larry Trask and Kalevi Wilk. If you have any questions about this product by Brand: McDonald Institute for Archaeological Research, contact us by completing and submitting the form below. If you are looking for a specif part number, please include it with your message.